View Oahu's most treasured sights from the sky on our 45 minute helicopter tour. Your window seat puts you up-close and personal with majestic Sacred Falls as provides you fabulous views of Diamond Head, Maunalua Bay, and the sheer cliffs of the Ko'olau Mountains. Some of Oahu's most incredible sights lie hidden from view but you can see them all on this amazing helicopter tour. Your tour begins over Honolulu’s famous harbor where for almost 100 years the Aloha Tower has welcomed arriving ships. Flying over Oahu's South Shore you see the beaches of Waikiki. A slow loop above mighty Diamond Head lets you peer directly into one of Oahu's most famous landmarks. You continue over crystal clear Maunalua Bay and head towards the island’s rugged eastern shores and Hanauma Bay’s spectacular reefs. You spy the little lighthouse perched above the cliffs of Makapu’u as you round the Eastern Shore and over the longest stretch of beach on the entire island of Oahu. Follow the Ko'olau Mountains up the Windward Coast to world-renowned Lanikai Beach and the aptly-named Chinaman’s Hat resting on the water. 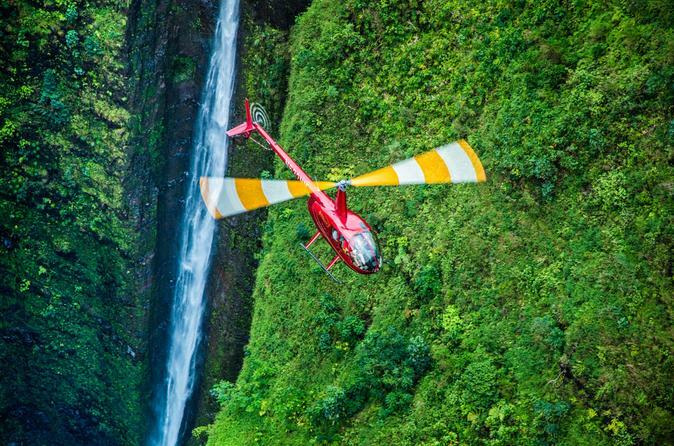 The pilot guides your helicopter into the pristine forest and jagged cliffs of the magnificent Ka'a'awa Valley. Hold on tight as you fly deep into the mountains for a panoramic view of Oahu's highest waterfall, Sacred Falls. You head back towards the airport with a passage over the mountains and the island's inland sea - Dole Plantation's "Pineapple Sea." The tour ends with low-altitude views of Pearl Harbor and the USS Arizona Memorial.